I am hoping to resolve two long-term frustrations this week. I've previously complained about mentioned my extremely annoying LOUD creaking floor. None of the usual remedies have had any noticeable effect. I had a handyman evaluate the situation, and he came to the same conclusion I did - replacing the subflooring is the only thing left to try. So Friday, they'll remove a large section of my living/dining room floor and install new. I fervently hope it will eliminate the noise. After a series of salon visits which ended in failure, I abandoned the idea of changing my hair from black to purple. In the months since then, I've experimented with bleaches and dyes on my bangs. I've discovered that my natural (undyed) hair bleaches out pretty easily, and Arctic Fox dye gives me a nice purple. 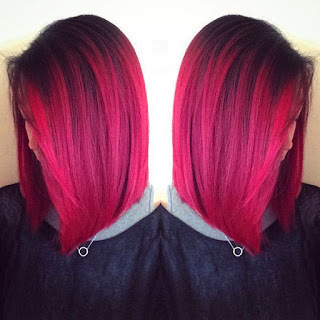 This led me to consider trying purple on the new growth, while leaving the previously dyed hair black. Thanks to Pinterest, I learned that putting color just on the roots is actually a thing. However, apparently it's usually done with white/platinum blonde hair. There are also many photos of dark roots with bright hair. But almost none of black hair with brightly colored roots. With few visual references, I don't really know what to expect, but I'm going to the salon Saturday to take the chance. So... On Sunday, I will either be enjoying my beautiful new hair while happily installing my new flooring on top of my new, silent subflooring... or I will be hiding under the covers dealing with massive disappointment. Good luck with the floors and hair! The different coloured roots sounds cool! it's kind of a "salon rule" that you put a natural hair color around your hairline, but obviously the purple/white hair above doesn't follow that and it looks great. Not sure why I haven't seen light roots and dark hair before. keep dying the roots and after a few years your whole head will be purple! I was a little surprised at how few (almost no) photos there are of light roots and dark hair, whether natural or unnatural colors. Your success story is reassuring. :) I have been letting my roots grow*, so I'll be starting with about 6 cm. *Not easy for me as I'm very picky about that. I've been hiding my hair in a ponytail every day for 2+ months. Thanks! I'm curious to see how my sparkles do with purple. I don't have grey in my bangs, but growing out my roots has shown that I have a LOT of grey over/behind my ears. I’m crossing my fingers for you! I know how hard it’s been for you to get your hair the way you want it, so good luck! As for your sub flooring I’m sure that will come out great! I can’t wait to see your new squeak free flooring! I don't understand why there are no pictures of coloured roots, it seems to me this is the only way to change colours drastically without killing your whole hair. Do that for a couple of years and you'll get rid of the black altogether. Good luck with the new flooring! Exactly! I thought the same. But I suppose the interim bright roots with dark hair isn't the kind of dramatic transformation picture that salons want to post (or people want to Pin). Good luck with your flooring and hair. May your salon experience be successful. Also, good luck with the floors. I've done purple roots with black hair before and it's a cool look. 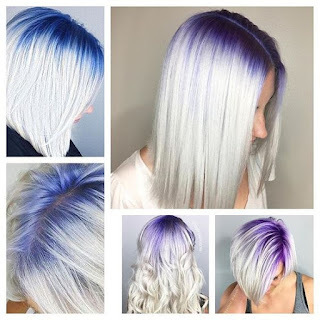 I d's mainly cuz my daughter had some dye left after dying the ends of her hair and my whites needed to be covered so it wasn't all purple but it looked good just the same. Office Outfit: How About Her Shoes?